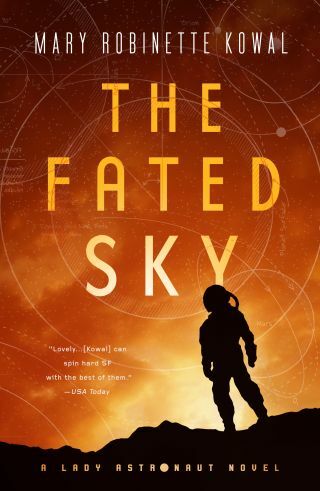 "The Fated Sky" by Mary Robinette Kowal. Mary Robinette Kowal is the author of "Ghost Talkers," "The Glamourist Histories" series, and the "Lady Astronaut" duology. She is a cast member of the award-wining podcast "Writing Excuses" and also a three-time Hugo Award winner. Her short fiction appears in Uncanny,Tor.com, and Asimov's. Mary Robinette, a professional puppeteer, lives in Chicago. Kowal's "Lady Astronaut" series, which opened with "The Calculating Stars," continues with "The Fated Sky," which came out in August. The book opens as mathematician-turned-astronaut Elma York, who fought in the first book for a more diverse astronaut corps, is beginning to look for her next adventure. At the same time, the organization in charge of space exploration has turned its sights to Mars. Read a Q&A with Kowal on the series here. Below, you can read an excerpt from the first chapter of "The Fated Sky." Aug. 16, 1961 — Horace Clemons, head of the International Aerospace Coalition, warned the United Nations today that any cuts in the "minimal" space budget would make a manned Mars landing in this decade impossible. He also cautioned that any extension in the timetable of the Mars program would increase the cost of the First Mars Expedition, now estimated at $20 billion. As a result of the $600 million cut made by the United States Congress in this year's budget, he said the IAC has had to sacrifice the "insurance" that had been built into the program "as a hedge against unforeseeable or intractable technical problems" and to delay crucial experimental flights in the Cygnus spacecraft. Do you remember where you were when the Friendship probe reached Mars? I was getting ready to return from the moon. I'd been up in Artemis Base for a three-month rotation, flying geologists from our tiny colony out to different survey sites. While we were all called astronauts, only a handful of us were also pilots, by which I mean glorified bus drivers. The rest of the two hundred "citizens" came and went, depending on their area of expertise. Only fifty or so were "permanent" residents in the underground bunkers we called home. Along with half the population of the base, I skip-walked in the light gravity through a buried gerbil tube called "Baker Street" toward "Midtown." With no atmosphere to protect us from the cosmic rays hitting the moon, we'd scraped up a layer of the moon's surface and buried the tubes in regolith. Aesthetically, the outside of the base looked like a decaying sandcastle. The inside was mostly smooth rubber, occasionally punctuated with light wells, aluminum supports, and pressure doors. One of the doors hissed open, and Nicole hopped through, holding the handle. She pulled the door closed behind her and dogged it shut. I spread my legs to kill my momentum as I landed from my last skip. She'd rotated to a position here on the last ship and it was darn good to see her. "Good morning." "I thought you were Earthbound." Like me, Nicole was wearing a light pressure suit, and had the rubberized safety helmet tethered at her waist like a gas mask from the war. It wasn't much, but in case one of the tubes was breached, it would give us ten minutes of oxygen to get to safety. "I am, but I wasn't going to miss the first Mars probe landing." I was currently on rotation as a copilot for the small shuttle from the base to IAC's Lunetta orbiting platform. It wasn't much more than a space bus, but the big ships like the Lunetta-to-Earth, Solaris class, were all piloted by men — not that I was irritable about that or anything. I patted the carryall that hung over one shoulder. "Heading straight to the Lunetta rocket after this." "Say hello to a hot shower for me." She joined me in skipwalking down Baker Street. "Do you think we'll see Martians?" "Not likely. It looks almost as bleak as the moon, at least from the orbital pictures." We reached the end of Baker Street. The delta-pressure gauge on the panel by the door read lunar normal 4.9 psi, so I pumped the rachet handle to open it. "Nathaniel says he'll pull out his own eyeteeth if there are Martians." "That's . . . graphic. Speaking of, how is he?" "Good." I pulled the door open. "He's been making noises about . . . ah . . . rocket launches." Laughing, Nicole slid into the Baker Street-Midtown airlock. "Honestly, you two are like newlyweds." "You should get him up here again to visit." She winked at me. "I mean, now that private quarters are an option." "Yeah . . . You and the senator should probably put a little more thought into how well the air ducts carry sound." I started pulling the hatch shut. "Hold the door!" In Baker Street, Eugene Lindholm bounded toward us with loping strides. If you've never seen someone move in low gravity, it's sort of like mixing the grace of a toddler skipping with the ground-eating stride of a cheetah. I pushed the door open wider. He corrected badly and cracked his head on the frame as he came through. "Are you okay?" Nicole caught his arm to steady him. "Thanks." He pressed a hand against the ceiling as he caught his balance. The other hand held a sheaf of papers. Nicole glanced at me before she moved over to the door into Midtown. I nodded and dogged the Baker Street door shut, but she didn't open the next door. "So . . . Eugene. As someone who flies with Parker . . ." She gestured at the papers in his hand. "I don't suppose you want to 'accidentally' drop some of those?" He grinned. "If you're hoping for duty rosters, all I've got are recipe clippings for Myrtle." "Drat." She opened the hatch and we headed into Midtown. Wafting in from the pressure difference came a scent rare on the moon, loam and green and the soft scent of water. The center of the colony had a broad open dome that allowed in filtered light, which nurtured the plants growing here. It was our first really permanent structure. The areas along the walls had been partitioned into living quarters. Sometimes I wished I were still berthed here, but the newer pilots' quarters were conveniently located by the ports. Other cubicles had been erected for offices and our one restaurant. There was also a barber shop, a second-hand store, and an "art museum." The very center held a tiny "park." By "park," I mean it wasn't much bigger than a pair of king-sized beds, with a path through the middle. But it was green. What did we grow in this carefully ameliorated soil? Dandelions. Turns out, when properly prepared they are tasty and nutritious. Another favorite, prickly pear, has beautiful flowers that turn into sweet seedpods, and flat pads that can be roasted or baked. It turns out that many of nature's weeds were well suited to growing in nutrition-poor soil. "Hot dog." Eugene slapped his thigh. "The dandelions are in bloom. Myrtle has been threatening to try her hand at dandelion wine." "By 'threatening,' you mean promising, right?" Nicole bounded past the raised beds. "Oh, Elma, also say hello to a dry martini for me when you get home." "I'll make it a double." I had thought that Nathaniel and I would be some of the first settlers on the moon, but with the Artemis Base established, the agency had turned its attention to settling Mars, and he had to stay on Earth for planning purposes. Mars consumed everyone's conversations at the IAC. The computers sitting over their equations. The punch card girls keying in endless lines of code. The cafeteria ladies ladling out mashed potatoes and green peas. Nathaniel, with his calculations . . . Everyone talked about Mars. And it was no different on the moon. On the far side of Midtown, they had brought out a giant four-foot television screen from the launch center and erected it on a sort of podium. It looked like half the colony was here, crowded around the TV. The Hilliards had brought a blanket and what looked like a picnic lunch. They weren't the only ones who were turning this into a social occasion. The Chans, Bhatramis, and Ramirezes had also set up on the ground near the podium. There weren't any children yet, but aside from that, it was almost like a real town. Myrtle had a blanket set up too, and waved Eugene over. He smiled and waved back. "There she is. Want to join us, ladies? We've got plenty of room on the blanket." "Thanks! That would be lovely." I followed him over to the blanket, which looked to have been quilted together from old uniforms, and settled down with Eugene and Myrtle. She'd trimmed her hair from its bouffant into something more suitable to the moon, mostly because aerosols were not a great thing to have in space. She and Eugene had volunteered to be some of the permanent residents. I sorely missed them when I was on Earth. "Hey!" A voice from the front of the crowd cut through the murmur of conversation. "It's starting." I rose onto my knees to see over the heads of the folks in front of us. In grainy black and white, the TV showed a broadcast from Mission Control in Kansas, though we were getting it with a 1.3-second delay. I studied each image, looking for Nathaniel. I loved my job, but being away from my husband for months at a time was challenging. Sometimes I thought that quitting and going back to being a computer would be appealing. On the screen, I could see Basira working away on equations as the teletype coughed out pages. She drew a strong line under a number and lifted her head. "The Doppler signature indicates that the two-stage separation has occurred." My heart ratcheted up, because this meant that the probe was about to enter the Martian atmosphere. Or, rather, it had entered already. The weird thing was that all the numbers she was getting from Mars were twenty minutes old. The mission had either already succeeded or failed. Twenty minutes old—I glanced at my watch. How much time did I have before I had to be in the hangar? Nathaniel's voice came over the television and I inhaled with longing. "Atmospheric entry in three, two, one . . . Speed 117,000 kilometers. Downrange distance to landing site is 703 kilometers. Expected parachute deploy in five seconds. Four. Three. Two. One. Mark. Awaiting confirmation . . ."
The entire dome seemed to hold its breath, leaving only the constant low hum of fans to stir the air. I leaned toward the screen, as if I could see the numbers coming off the teletype or help Basira with the math. Though, in truth, it had been four years since I'd been in the computer department or doing anything more complicated than basic orbital mechanics. "Confirm parachute. Parachute has been detected." Someone let out a whoop in the dome. We weren't down yet, but oh — it was close. I wrapped my fingers in a corner of the quilt, clutching it as if I could steer the probe from here. "Awaiting confirmation from the spacecraft that retro-rocket ignition has occurred." Still, Nathaniel was talking about an event that had happened twenty minutes ago, while I was listening to his voice from 1.3 seconds ago. The vagaries of life in space. "At this point in time, we should be on the ground." Please, oh, please let him be right. Because if they failed to land that probe, the Mars mission would come to a sudden and grinding halt. I looked at my watch again. He should be announcing confirmation of the landing, but the seconds just ticked by. "Please stand by. We are awaiting confirmation from the Deep Space Network and the Lunetta relay station." Nathaniel wasn't on the screen now, but I could picture him standing at his desk, a pencil gripped so tightly in his fist that it could break at any moment. Beside me, Nicole inhaled sharply. "What is that?" The tone repeated, and Mission Control dissolved into cheering. Nathaniel's voice rose as he fought to be heard over the din. "What you're hearing, ladies and gentlemen, is the confirmation tone from our Mars probe. This is the first broadcast from another planet. Confirmed. Friendship has landed, paving the way for our manned mission." I jumped to my feet — we all did — and forgot about gravity. Laughing and soaring awkwardly through the air, I cheered for the success of the Friendship probe and the team who had planned the mission. You can buy "The Fated Sky" on Amazon.com. Follow us on Twitter @Spacedotcom and on Facebook.